Figure 2.2.1: One cell divides into two, which begins the creation of millions of more cells that ultimately become you. Image used with permission (Public Domain; National Institutes of Health). Figure 2.2.2: The cell is structurally and functionally complex. Although we defined the cell as the “most basic” unit of life, it is structurally and functionally complex (Figure 2.2.1). A cell can be thought of as a mini-organism consisting of tiny organs called organelles. The organelles are structural and functional units constructed from several macromolecules bonded together. 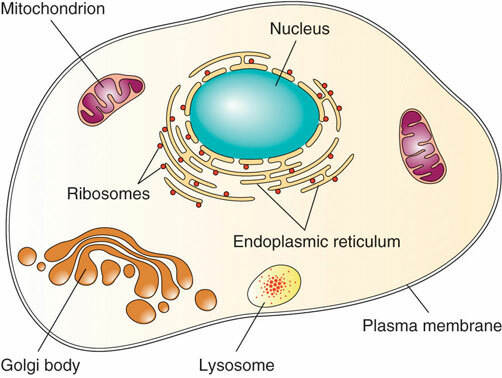 A typical animal cell contains the following organelles: the nucleus (which houses the genetic material DNA), mitochondria (which generate energy), ribosomes (which produce protein), the endoplasmic reticulum (which is a packaging and transport facility), and the Golgi apparatus (which distributes macromolecules). In addition, animal cells contain little digestive pouches, called lysosomes and peroxisomes, which break down macromolecules and destroy foreign invaders. All of the organelles are anchored in the cell’s cytoplasm via a cytoskeleton. The cell’s organelles are isolated from the surrounding environment by a plasma membrane. Figure 2.2.4: Plants harvest energy from the sun and capture it in the molecule, glucose. Humans harvest the energy in glucose and capture it into the molecule, ATP.